Copy was provided by the author in exchange for an honest review. This did not effect my rating. At long last, I’ve found a book that I can give for a recommendation to people who want a good starting point in Tudor history. It’s a lot of history and a lot of years, along with a whole bunch of names as people go in and out of favor. This is a very small book. 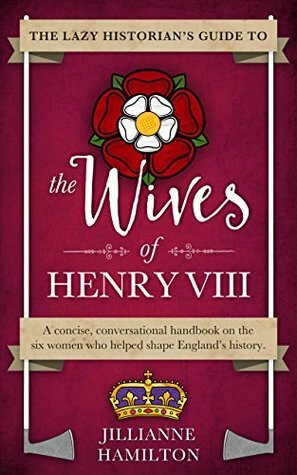 It ends on page 173 and then there are about twenty pages after it of family trees, sources/book recommendations for each wife and the general topic of Henry’s wives, and a glossary of important people and places. All of those things are very important for a handbook like this. It’s an easy reference to draw from. The life of each wife is covered from birth to death. A lot of their lives somewhat tangle together, but Hamilton keeps them very separate. In each section, she keeps to the specific wife without getting into too many things about the next one. That’s appreciated because you can turn to a specific section and you know it’s going to be only about that one wife rather than somewhat about her and also waxing on about a later wife. At times, I kept wanting a little more or wishing there had been more ideas explored — especially in Catherine Howard’s section — but I had to take a step back to remind myself that this is just a handbook. It’s not a tell-all about that wife. It’s nailing down the important historical things and not every little detail. If I want all the little details, then I’d go to the back to see any book recommendations that were there. When I glanced back at the sources used/book recommendations, part of me cringed seeing Alison Weir included. But then there were so many other books included — some I had read, some I hadn’t, but most I had heard of in some way — that it gives a better picture of the topic. The humor really worked in this book. Sometimes I thought it was because I’ve already read a lot about Henry’s wives, but then I also think that it just worked. If you’ve wanted The Tudors, it plays on that and, at times, vocalizes the things that you were thinking while watching it. I highly suggest this book to those who are Tudor history beginners or who want a refresher on what can be a very dense topic. Thanks to the author for providing me with a copy! This sounds like a great starter book to get a grasp of the basics! Exactly! This is perfect for it. It reminded me of another book I read (which is somewhere deep in this blog) about 1066 & the Battle of Hastings In a Nutshell by Charlie Fenton. A great introduction to a dense topic. Ha! Well, the In A Nutshell series is fantastic. Seriously. The book I recommended is by an author I know. Then, another author I know wrote a book in that series about Catherine Carey (Mary Boleyn’s daughter). Then, there’s ones about Henry VIII’s health (written by someone who has written a long book about the same topic) and the sweating sickness. Basically, check out that series if you can! A lot of them are on Kindle Unlimited, but I don’t think the UK can get that. Oh, good!! Every single one I’ve read, I really enjoyed. MadeGlobal is a fantastic company, too. Whenever you read some, I hope that you like them!